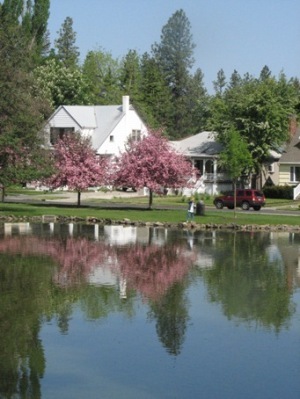 According to the book, “Manito Park, A Reflection of Spokane’s Past”, the original Wyatt of Tombstone Arizona fame speculated in several businesses in the Coeur D’Alene mining district, and in 1884 became a deputy sheriff for Kootenai County. He was involved in at least two local gunfights in Eagle City, Idaho, about 85 miles East of Spokane as the crow flies. These events were recorded on April 5, 1884 and June 28, 1884 issues of the “Spokane Falls Review”.